Rogue Unit is a collaboration between myself and my friend Zach Macias. In the spring of 2016, the Go Rogue contest was announced to promote the upcoming Star Wars film Rogue One. Zach and I decided to team up and enter. After we had hashed out a simple story, I tackled most of the set and prop construction while Zach polished the story and storyboarded. Considering how little they show up in the final film, I spent way too much time and effort and miniature palm trees. Fronds were made from cardstock, painted green and glued to a bundle of florist wire. The trunk was made from Sculpty and textured with a wire brush before being painted. Craft sand was glued to thick sheets of plastic to form the basic beach. For sand that we wanted to animate, we used Brookstone kinetic sand. Simple desk lamps with lighting gels provided most of the light. 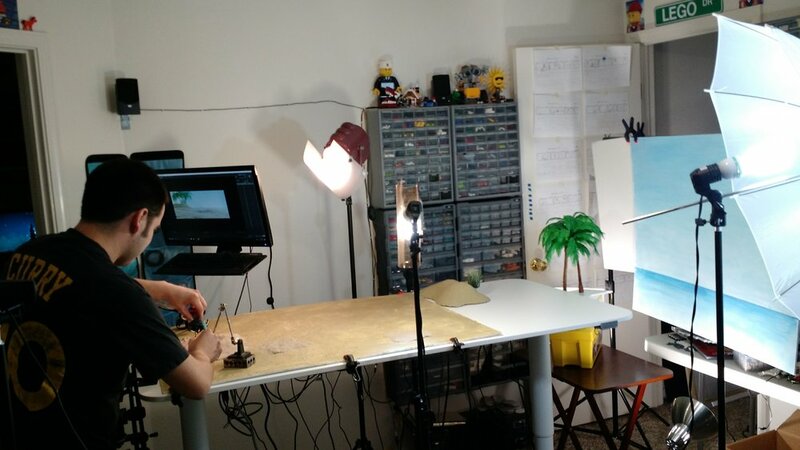 I was still busy building the interior set when Zach showed up for the weekend to animate, so he shoot almost all of the beach scenes. For the very long shots, my "studio" (really just the spare bedroom in my apartment) was pushed to its very limits. My animation table was turned lengthwise, and the backdrop was set back even further. The doorway was actually blocked during the filming of this shot, and the only way to exit the room was to very carefully crawl under the backdrop and through the maze of light stands. 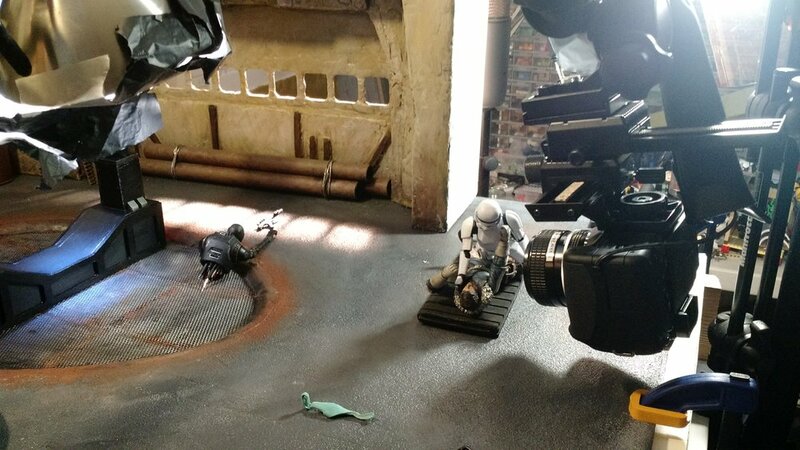 The kinetic sand was extremely useful in shots like when K-2SO is crawling through the sand, and we needed the sand to be manipulated and interacted with by the puppet. For the quick shot when K-2SO is blown up, half a dozen rigs were needed to hold his exploding limps in place. We used some green craft foam as a makeshift greenscreen, but in the end we keyed out everything manually. While Zach was animating, I was downstairs in the living room making the main set. It was constructed from a plethora of random materials, including a styrofoam packing unit that housed a computer monitor, sheets of foamcore, wood, craft foam, plastic tubing, and wire mesh. A liberal layer of spackle was applied to the model to give it a cohesive texture. This was something I definitely should have done sooner in the production process - the thick layers of spackle took far too long to properly dry, and I had to stand there for hours with a heat gun to speed up the process. My girlfriend Danielle, who is much more talented in painting and color theory than I am, helped paint the spackled walls to mimic a dirty stone texture. Hair gel was used to create the crashing waves on the shoreline. The gel was viscous to remain animatable, while still retaining the appearance of water. Unfortunately, two bottles of hair gel under the hot lights of the studio resulted in some strong flowery odors! While the walls of our set were modular, the floor was not, which forced us to come up with creative solutions when positioning the camera. 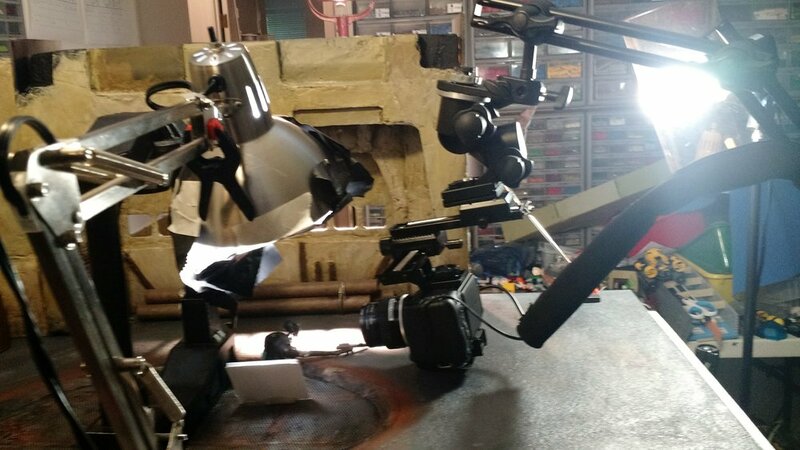 This abomination of a camera rig, complete with hanging the camera upside down, was needed to get the extreme close up of the puppet. Zach animated the majority of the film, including the climatic fight scene. The extended single shot of Cassian and the stormtrooper fighting took over 8 hours to animate! Zach could only stay for the weekend, so we should the most important and challenging shots while he was available, and then I wrapped up shooting over the following weekend. Together we worked on post-production and visual effects. Ultimately Rogue Unit did not win any prizes, but we are extremely proud of the final result. 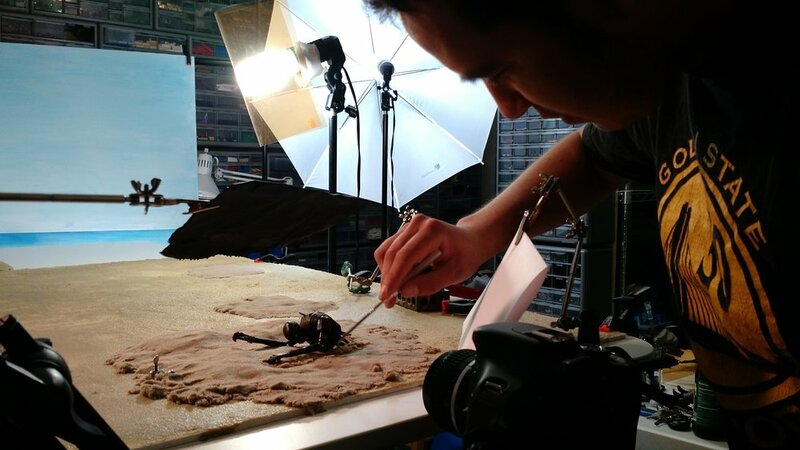 This project showed both of us that animating larger puppets with more articulation wasn't as hard of a transition as we were expecting, and it got us excited to try new projects that expanded beyond LEGO animation. Plus, this is really nice film to be able to show people when they ask about your "moviemaking hobby."